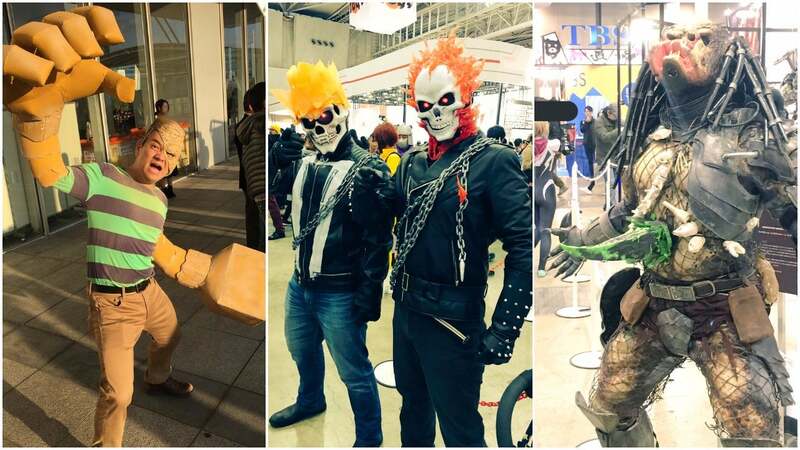 Tokyo Comic Con just wrapped up, so let's check out some of the best - and most entertaining - cosplay of the show. Held at the Makuhari Messe in Chiba, Tokyo Comic Con kicked off last Friday and ran through Sunday. Since this is Comic Con, cosplayers mostly portrayed Western comic book, video game and movie characters, instead of JRPG and anime characters. Have totally forgot to tweet but we've had a Joker get-together at Tokyo Comic Con yesterday! Damn i should have gone back for day 2. I went to day 1 and saw literally every exhibiton and stall and a decent bunch of cosplayers. Decided not to go for day 2 because stuff a $20 return train fare and an hour each way to MAYBE see a few different cosplays. Unfortunately seems like there were a bunch though, so kind of annoyed i didn't go. Oh well though. I saw that masterchief when i was there but did not see the symbol on his shoulder. Go Oarai master chief, new commander of the ankou team tank. Or is he just his own tank. Also funny coincidence, i just got back to tokyo from visiting Oarai. It was actually the first Con i went to, just always had things on during any in melbourne, but i happened to be in tokyo at the right time so i went. Anyone else here go to it? is it what all cons are like? it was overall fun and im glad i went but it got boring kinda quick. Damn. Thats some amazing cosplay.